Making the move to Office 365 provides organizations with many benefits; from increased enduser productivity to reduced cost and complexity of maintaining on-site hardware. Additionally, Microsoft reduces the risk of downtime substantially by running applications across highly available architectures spread across different regions. While application downtime is reduced in Office 365, the risk of data loss due to human error is not. While Office 365 does provide customers with some protection against loss of data, often the window for data recovery is short and the recovery options limited. Seeking an additional layer of protection against accidental or malicious data loss, organizations have begun to use third-party backup solutions that offer enhanced protection of Office 365 data, longer retention periods, and more robust recovery options. Why is Office 365 Backup Necessary? More often than not, data is deleted only to later realize that it is still needed. While it is possible to recover deleted items from within Exchange Online and OneDrive for Business, the retention for these items is often inadequate. In Exchange Online, individual emails that are deleted by users get moved to the users' Deleted Items folder. Those items will remain in the Deleted Items folder for 30 days by default or according to the duration set by the administrator. While the Deleted Items folder does provide a layer of protection against end-user errors, messages can be permanently deleted if the user chooses Empty Deleted Items folder. Once items are deleted from the Deleted Items folder, they are then moved to the Recoverable Items folder and into a subfolder named Deletions. The default duration of items in this folder is 14 days, with a maximum duration of 30 days. Once an item exceeds the retention setting, the item is gone forever. For more information regarding Exchange Online email retention, please read this TechNet article from Microsoft. When users leave an organization, Microsoft Exchange Online does make it possible to preserve the contents of deleted mailboxes. By placing a Litigation Hold or an In-Place Hold on the mailbox before the Office 365 user account is deleted, the mailbox becomes inactive and its contents preserved for the duration of the hold. However, in order to use the Litigation or In-Place Hold features, a separate Exchange Online or Exchange Online Archiving license may need to be purchased. If a hold is not placed on a mailbox before it is deleted, the contents of the mailbox will no longer be preserved or discoverable. For OneDrive for Business data, deleted items are put into a user's Recycle Bin. The items stay in the Recycle Bin for 93 days or until they are manually deleted from the Recycle Bin. After being removed from the Recycle Bin, the items are moved to the Site Collection Recycle Bin, where they are recoverable up to 93 additional days. Once an item exceeds the 93 day retention in the Site Collection Recycle Bin, the item is gone forever, according to the following support article from Microsoft. 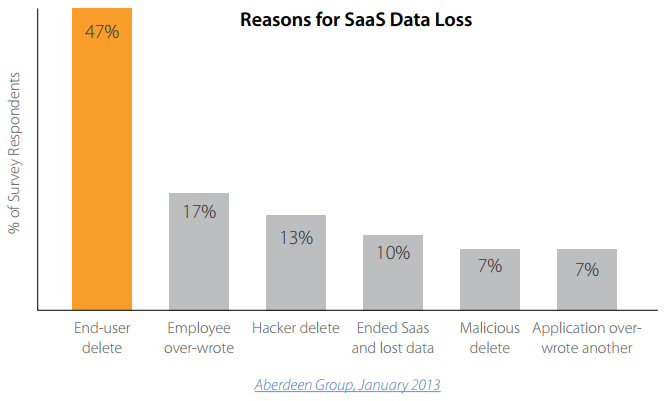 According to a January 2013 survey by Aberdeen Group, the number one cause of data loss in a Software as a Service deployment, such as Microsoft Office 365, is accidental data deletion. In fact, about 70% of all lost data is due to either accidental or malicious deletion of data by end-users. While Microsoft takes several measures to ensure that service availability is not disrupted, the measures taken to ensure that permanent data loss does not occur are limited. In fact, Microsoft only offers recommendations on how to perform item-level recovery using the retention safeguards mentioned above. However, if data in the Deleted Items, Recoverable Items, or Site Collection Recycle Bin have exceeded the retention policy or if the data was manually deleted from those locations, that data is most likely gone forever. Barracuda Backup is the leading integrated backup appliance in the world according to IDC's Purpose-Built Backup Appliance Tracker. The product has always been cloud-connected and offered cloud replication, and now also offers Cloud-to-Cloud Backup for Office 365. Cloud-to-Cloud Backup protects Exchange Online and OneDrive for Business data by backing it up directly to Barracuda Cloud Storage. Barracuda Cloud-to-Cloud Backup for Office 365 can be used as an add-on to an on-premises Barracuda Backup appliance or as a standalone subscription without an appliance. For Exchange Online, Barracuda Cloud-to-Cloud Backup protects all email messages, including all attachments, as well as the complete folder structure of each users' mailbox. In OneDrive for Business, all files under the Documents Library, including the entire folder structure, are protected. Unlike other solutions, Barracuda Cloud-to-Cloud Backup for Office 365 provides completely customizable and unlimited backup scheduling and retention, the ability to restore or download data to different sources, and the ability to backup multiple instances of Microsoft Office 365 without the need to purchase additional licenses. Mistakes happen, users accidentally delete or over-write files. Disgruntled employees or hackers take malicious action in deleting or corrupting data. As the only vendor in the market providing a single solution to support both on-premises and cloud-based sources, Barracuda Cloud-to-Cloud Backup for Office 365 lets you fully customize your backup schedules and retention policies, lets you restore or download data to different sources, and gives you the ability to backup multiple instances of Microsoft Office 365 and an unlimited number of users with simple, capacity-based pricing. Barracuda Backup now provides protection of physical, virtual, and cloud environments, helping you keep IT simple. Microsoft Office 365 backups can be fully automated by creating customizable backup schedules to backup data when you want or you can choose to run backups on-demand at any given time. Optionally, backup schedules can be repeated throughout the day as fast as every 60 seconds, achieving near-continuous data protection. All Exchange Online and OneDrive for Business data is deduplicated and compressed for maximum storage efficiency before being stored in the Barracuda Cloud. All Office 365 data backed up to the Barracuda Cloud is accessible, searchable, and retrievable from anywhere with an Internet connection. By selecting specific dates from a built-in calendar, point-in-time recovery of data - mailboxes, folders, files, and email messages - can be achieved. Files or email messages can be restored back to the original user account and location, to a different location within the account, or a completely different user account. If you're looking for a specific file or message but are unsure of its location, the search feature can be used to quickly and easily find the item, where it can be restored or downloaded. Downloading folders puts them into a compressed ZIP file for quick downloads, while email messages are downloaded using the industry-standard EML format. Files are downloaded using their same file format, unless multiple files are selected, then they are put into a ZIP file for easier access. For IT Administrators, detailed reporting and audit logging are key components of a backup solution. 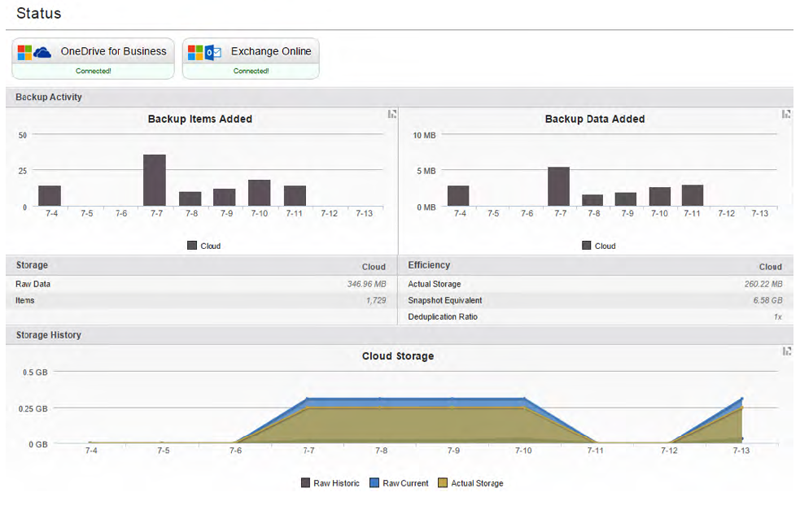 Barracuda Cloud-to-Cloud Backup provides backup status and health monitoring for each backup source. Automated email alerts are delivered after each backup to specified email recipients containing a summary of the backup and detailed information about which email messages and files were added, modified, and removed since the last backup. On the Status page, graphs show the number of items added and amount of data backed up each day. Storage statistics and graphs detail how much data has been backed up overall and the storage efficiency, how much data is actually being stored in the Barracuda Cloud after deduplication and compression. An Audit Log tracks and provides details about every action performed within the Cloud-to-Cloud interface. Barracuda Backup has always been known for ease of use, and the cloud-to-cloud backup features are no exceptions. Existing Barracuda Backup users will feel right at home with this new functionality, and new users will be able to learn it within minutes. The Cloud-to-Cloud service is listed among other Barracuda Backup appliances in Barracuda Cloud Control for easy access and management. For more information on how to configure Office 365 data sources, see the Office 365 backup section of Barracuda's TechLibrary. All Barracuda Backup appliances and Cloud-to-Cloud Backup services can be managed through a “single pane of glass” with Barracuda Cloud Control, Barracuda’s cloud-hosted centralized management interface. Barracuda Cloud Control can be accessed from anywhere with an Internet connection, making it possible to access and recover your organization’s data at a moment’s notice. By downloading the Barracuda Cloud Control Mobile App, you can view the health status of your backups and backup appliances from your Apple iOS or Android mobile devices. Barracuda Cloud Control also provides role-based administration, allowing you to add and remove users, assign product entitlements, and control access to what functions they can perform in Barracuda Backup and Cloud-to-Cloud Backup. Creating flexible and fully customizable retention policies is easy, allowing you to specify how long to keep your organization’s historical data. Create global retention policies for all Office 365 data or get granular by creating different policies for different users or sets of data. A handy retention calendar visually lays out what your retention timeline will look like on the fly. One of the largest concerns for organization's looking to protect their data in the cloud is security. With Barracuda Backup, all Office 365 data is encrypted in-transit with 128-bit SSL encryption, the same level of security used by most banks and financial institutions. Data stored in the Barracuda Cloud is encrypted at-rest using 256-bit AES encryption. 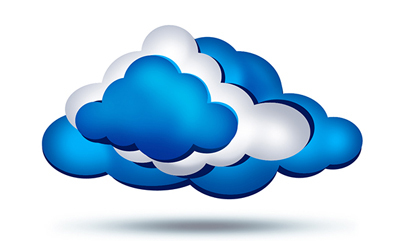 Barracuda Cloud Storage regularly undergoes 3rd party audits and is SSAE 16 Type II certified. Additional layers of protection included in Barracuda Cloud Control are multifactor authentication, IP address login restrictions, and role-based administration. Click here for more information on Barracuda Cloud Storage standards and protection.